King bed in the master, queen bed in the second bedroom, queen in the third bedroom, and a queen size sleeper sofa. Offers well-stocked kitchen, 4 TVs/DVD's/a VCR, cable, fireplace, stereo, jetted bathtub, and a gas grill on the lakeside balcony. 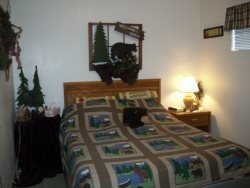 This condo, set at the 19 mile marker, is practically seconds from all the action in the Lake area. Located off the main strip, this condo is a short distance to the best dining at the lake, golf, 110 store outlet mall, cinemas, boat rentals, go-carts, state park, entertainment centers/mini-golf, water park, supermarkets, and more. Complex offers an outdoor pool and elevators. Unit offers 14x36 boat slip at an additional charge.